A simple silhouette shows how the colors of Berroco Aero behave when worked in the round. 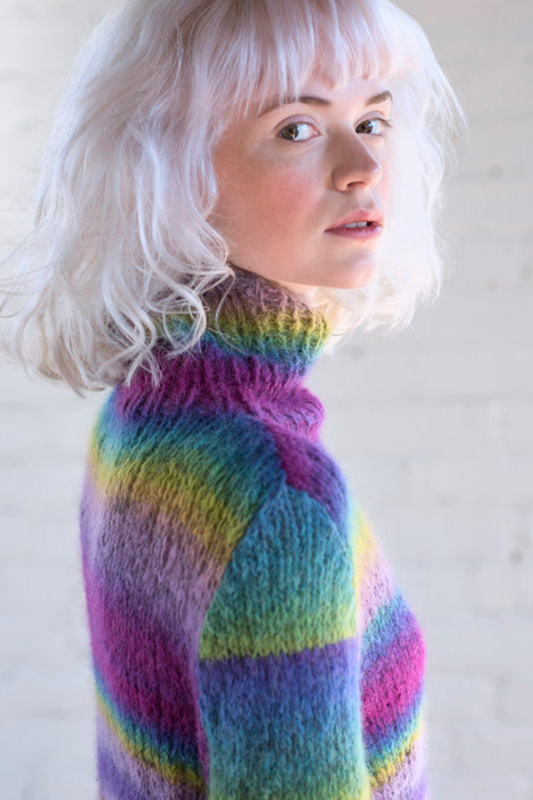 Knit in one piece to the armholes, this easy sweater lets the colorful yarn do all the work. Color Shown: Berroco Aero (50 grs): 4 (4, 5, 5, 6, 6, 7) cakes #8014 Aurora Borealis. Finished measurements: Bust-30 (34, 38, 42, 46, 50, 54)" Length-22 (22 1/2, 23, 23 1/2, 24, 24 1/2, 25)" Shown in size 34" with approximately 2" of ease. Malabrigo Heritage Collection Patterns - Pintado - PDF DOWNLOAD and Berroco Booklet 396 Regatta Patterns - Beleza - PDF DOWNLOAD are both similar patterns: adult pullover garment, for women, and bulky (12-15 sts/4 in) yarn gauge. You may enjoy taking a look at the , and Berroco Aero Mera Pullover kits all using Berroco Booklet 401 Aero Patterns. Hopefully our suggested yarn options for Tirso - PDF DOWNLOAD can help you come up with your next exciting new project idea!